Get your dish on the menu at Fargo’s Food Factory! How many times have you been to a restaurant and scanned the menu only to think I wish they had that on the menu. Well think no more thanks to the team at Fargo’s Food Factory who want to put the power in your hands. 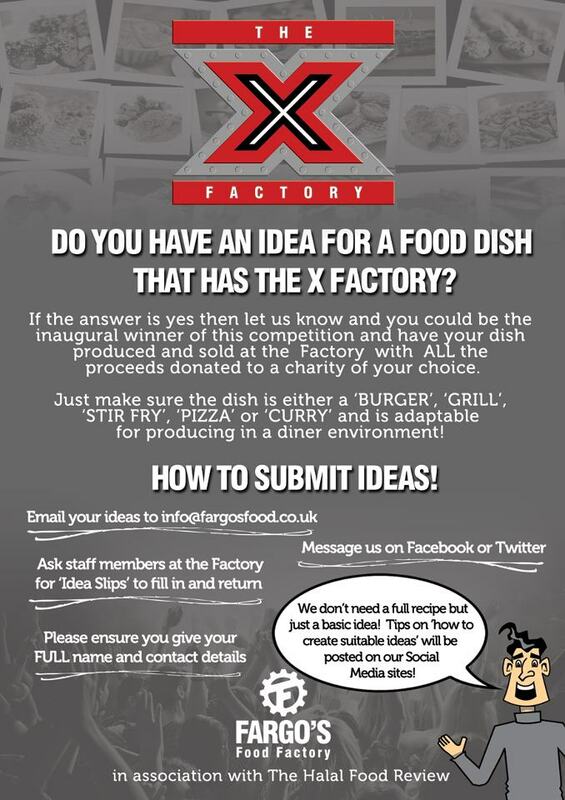 They are running the very aptly named X Factory competition where diners can suggest a dish to be added to their menu. So if you have an idea for a new burger, grill, stir fry, curry or pizza dish let the team know. You can do it via Twitter, Facebook or best of all in person at Fargo’s itself. Categories: American Diners / Burger Specialists, BIRMINGHAM . Tags: Fargo's, Fargo's American Diner, Fargo's Food Factory, Halal Burgers, Halal Food Review, Halal Grill, Halal Pizza, Halal Stir Fry . 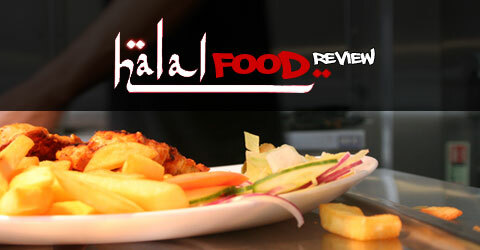 Author: halalfoodreview . Comments: Comments Off on Get your dish on the menu at Fargo’s Food Factory! Salaams and welcome back to the Halal Blogosphere, where we have been in an extended halal hibernation since before Ramadan. Apologies for the absence and just like your favourite Uncle or Auntie we’re back! For our comeback review we decided to pack our bags and leave Birmingham, yes we do travel and we were granted a visa to leave the second city and headed for the home of the premier league champions Manchester! The purpose of our visit was to see a new play by one of our friends which was showing at Contact Theatre and then to pay a visit to the British Muslim Heritage Centre. We enjoyed the theatre and were thoroughly inspired by the work and vision of the BMHC which in our humble opinions has the potential to be one of the most amazing Muslim led cultural initiatives in the UK. Enough of art and culture what about the food I hear you cry! Based on the recommendation of our local theatre star we headed to Wilmslow Road and ended up at Beirut Restuarant a Lebanese restaurant in the middle of the strip. The restaurant itself looks pleasant enough, the decor is of a good standard fusing traditional and contemporary design features. We arrived around 10pm and it was great to experience the buzz and energy of Wilmslow Road. As a Brummie I have to confess I love our Balti Triangle but we seem to have lost the energy and the atmosphere that is alive and kicking in Manchester’s famed curry mile. The restaurant wasn’t particularly busy when we arrived and we were promptly seated. The menu is fairly standard in terms of Lebanese cuisine, the restaurant doesn’t have a live website and didn’t have any menus to take away. I forgot to photograph the menu before we left so apologies in advance if I don’t remember all the dish names. When it came to ordering we encountered our first problem, the restaurant had no sharwarma left. That becomes a bigger problem when shawarma is a key component of a number of your dishes whether its starters or main courses. It’s a bit like an Indian restaurant running out of chicken tikka! On the plus side it does make you experiment and try something different. For starters we ordered hummus, chicken liver and a pizza. The restuarant served complimentary bread and olives. The starters were ok, nothing spectacular, the highlight was definitely the chicken liver. The pizza and hummus were what you would expect. Credit to the service team they were more than happy to replenish the very nice traditional chilli sauce they serve. For the mains we ordered a selection of kofta chicken, lamb chops, a full baby chicken, rice, fries, a kofta chicken wrap and a traditional pastry based meat dish. We were hoping for something really special with the mains unfortunately it was a bit of a mixed bag. The traditional pastry dish which I thought would be a deep filled pie was another pizza type dish, hands up I should have asked for clarification. I was expecting Beirut’s equivalent of a Betty’s Hotpot but we got a second pizza type dish instead! The chicken was underwhelming, both the kofta and the baby chicken were on the dry side. The lamb chops were much better. The highlight of our dining experience was the traditional Arabic tea we ordered to round off our evening meal. There is nothing better to complete an evening with at a Middle Eastern restaurant. Our experience at Beirut was ok, it wasn’t brilliant and when you come to Manchester you always have higher expectations. The restaurant has a nice atmosphere but overall it felt like we had one of those last customers in a restaurant experience when some of the food you really want is not available and then the alternatives you select don’t really hit the spot. Customer service was ok, our waiter was helpful in offering alternative suggestions of what to eat but sadly the food didn’t quite hit the spot. Our group of four diners paid £55 for a set of four starters, four mains, soft drinks and Arabic tea. In terms of pricing its fairly standard for mid range Arabic restaurant. So what are the scores, George Doors? Its that time of the year when we are blessed with the opportunity to fast during the month of Ramadan. Ramadan provides a wonderful opportunity for the Muslim community to take stock and reflect and inshallah improve our state of spiritual and physical well being. Ramadan is also a month when the Muslim community is most generous in its support of those less fortunate than ourselves. This Ramadan we want to draw our readers attention to an excellent initiative set up by the As Suffa Institute in Birmingham which aims to tackle the issue of homelessness within our communities right here in the UK. We encourage all our readers to give to this noble endeavour. We remember how generous you were when we did our last fundraising campaign for the Feed the Poor Charity and inshallah our readers can be equally generous this time around with the added benefit of giving charity during the blessed month. Until the next time, stay blessed and please do remember us in your duas during Ramadan. One of the most frequent requests we get are from people interested in writing for the Halal Food Review. Unfortunately on most occasions that initial enthusiasm doesn’t last. We’ve lost track of the number of people who were going to submit a review but for whatever reason were unable to do. It has had a bit of a knock on effect on here too where we have been less than brilliant in terms of getting back to people who do express a genuine interest in writing. So please do accept our apologies if you’ve written to us with an interest in writing for us and then not hearing from us. Alhamdulillah we think we have a solution! If you are interested in writing for the Halal Food Review, we’ve outlined below a basic template for the types of things we like to have covered in a food review. So if you want to write a review, follow the guide and then submit your review to us on Facebook by sending it to us as a message. In order to do this just like our page at http://www.facebook.com/halalfoodreview which will enable you to send us a private message. We can then review your review so to speak with the view to publishing it on the site. There is no hard or fast rule to our reviews, all we ask is for contributors to be honest both in terms of their positive and negative feedback, neutrality is absolutely essential and we expect our reviewers to be 100% impartial. We also ask our contributors to only review restaurants that they have no personal or financial declaration of interest in. We also encourage our reviewers to add a bit of their own personality to the review to make it unique. Unless a restaurant is trully exceptional or really really bad we don’t tend to see to many scores of 10 or 1. Again we ask our reviewers to ensure the narrative of the review reflects their scoring so if you think it was good tell us what made it good and vice versa if it is poor. Reviews do vary in length but we do encourage our reviewers to cover the criteria listed below. Its not a complete list feel free to adapt but it just gives you an idea of things that interest our readers. Tell us where you are eating? Why did you choose to eat here? Who is eating with you? Where is the restaurant? What type of cuisine do they serve? Is there anything interesting we should know about the restaurant or the location that might be of interest to readers? Where is it located? Is there car parking available? Describe the restaurant? What are your thoughts on the decor? How many covers does the restaurant seat? What are the toilet facilities like? Is it child friendly? Was it busy? Did you have a positive customer service experience? Rate the waiting staff? Was complimentary water served? Were tables clean? How long did it take for you to receive your order? Did the restaurant offer flexibility to meet dietary requirements? Summarise the menu, what are the specialities, what did you order? How big were the portion sizes? How do you rate the quality of the food? What were the positives and weaknesses? Are there child friendly options on the menu? Was there ample choice for vegetarians? Salaams and welcome back to the Halal Blogosphere where good food meets creative writing. We’re heading into the blessed month of Ramadan and no doubt there will be plenty of tempting offers to entice those fasting into restaurants across the land! Both social networks are the easiest way to take advantage of special offers restaurants alert us to. So if you don’t want to miss out, make sure you connect. Today we have a guest review from Halal Food Review reader Imtiaz who recently visited the new Al Basha Lebanese bakery on Warwick Road in Acocks Green, Birmingham. If its the same Al Basha we think it is, then it has relocated from it’s previous premises on Edward Road in Balsall Heath. Over to you Imtiaz! So, on a Wednesday night, me and my parents went to Al Basha Lebanese bakery on Warwick Rd in Olton. It is opposite the McDonalds and a bit out of the way from all the other Middle Eastern Restaurants on and around Coventry road. Totally worth the trip though. It is a small restaurant (It probably seats 25 people max) and does a lot of takeaway business, but its owner Abdul is very accommodating and welcoming. It has only been open a few months, so is still having minor logistical issues like running out of ice. However, it had been a very hot day and the drinks were still cold, so like I said, minor. The decor is very simple, as is the restaurant, but the food is presented well and the staff are friendly, helpful and engaging. There are no toilet facilities as the restaurant is more geared up to takeaways. On to the food. Al Basha serve a traditional Lebanese menu which offered a varied choice. We started with Stuffed Vine Leaves, which were served warm. This is not something that I am used to and I found the texture a little odd dare I say it even a bit mushy. I would prefer the vine leaves cold but my parents prefer them warmed up. It’s obviously down to personal preference and something you may want to try next time you have them. We also had the Hummus served with Khobez, which is a Lebanese bread with sesame seeds on it. The bread was a great accompaniment to the Hummus which had been made spicier with some chilli sauce adding a nice extra kick. The bread was very well received, so well received that we also took some home. I have to say, the bread was almost as good the next day as it had been when it came fresh out of the oven. Now on to the main course. Going for Lebanese food, we always have something from the grilled meats menu for mains and this visit was no different. We had the Mix Grill 2 which includes a total of 10 skewers of meat, including Chicken and Lamb Kofta, Chicken and Lamb Shish and some Chicken Wings, which had been made extra spicy. The meats was very well cooked and melted in your mouth. They were accompanied by rice, chips and salad. We all consider ourselves to have hearty appetites and we couldn’t finish the platter and had to take 3 skewers home. (the meat not the metal skewers!) Small portions are definitely not an issue at Al Basha. The food was accompanied by some nice chilli sauce and mint mayonnaise, which was something I had never had before. It was refreshing and hit the spot, my Dad decided to take some home. The food was excellent value for money and can be seen in the prices below. Quality of Food – 9. I really couldn’t fault anything we had; it was all presented well and tasted as good as it looked. Quality of Decor, Facilities – 5. As mentioned, it is quite small and a lack of toilet facilities is a hindrance, but if you can manage without these, it really is worth going. Or get a takeaway. Quality of Service – 9. Again, really great. The staff we talked to were helpful and accommodating, dealing with our requests in a friendly manner. As you can probably tell, I’m not very good at writing reviews and didn’t plan on writing one when I went to the restaurant (As much as I use the Halal Food Review, I have never thought about submitting anything myself). However, I was won round by the staff and the food and definitely think that more people should go to it and experience a great meal.